The Wandering Arborist: Don't worry, it's not that complicated. I'm constantly amazed at the over simplification of plant maladies that most people subscribe to. 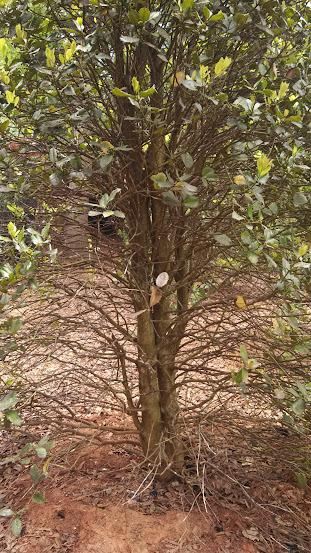 If a tree or shrub is looking 'sick', then it must be some inauspicious bug or disease causing the problem, and a one time spray of something should solve the problem. If not some magic spray, then the obvious solution is to 'feed' the poor starving plant. Often we can find a tree damaging pest or signs of nutrient deficiency on our sickly patient, but it's the greater predisposing factors which are leading to the plant's decline. Recently I was asked to look at some sickly shrubs. Within a few moments I learned the following; when the property owners purchased the plants they got a good deal because the shrubs were old stock and not looking great (in some cases dead bark was peeling from the trunks), when installing the shrubs the planting holes were over amended with compost, and they’d been applying a complete fertilizer liberally to the root zones. In the mean time the root balls of most of the shrubs had settled to several inches below grade. After the shrubs started to look really bad, the property owners assumed some unknown but malevolent pest was attacking their plants, and began spraying them with horticultral oil. My assignment was to identify what was wrong with the shrubs and develop a plan for their improved health. The diagnosis? What was wrong with the shrubs is everything. Substandard plants, installed incorrectly, with soil chemistry all mixed up. There was no baleful insect or disease, just a series of preventable cultural mishaps, which so often after having occurred are left to an unsuspecting arborist to diagnose. The remediation plan? Basically, start the planting process from the beginning, which included removing and replacing a handful of the previously installed plants. The results of this encounter was a dissatisfied property owner left doubting the diagnoses of the consultant that was subcontracted through their primary tree care provider. At the end of jobs like these I almost feel guilty charging my fee, and I know the clients are never too happy to pay. Maybe next year there will be a magic potion for this. What could be going on with this sad looking plant?